Personal watercraft accidents (Jet Ski accidents, Wave-runner accidents, Sea-doo accidents, etc. . .) are extremely dangerous due to the high performance of these watercraft and the nature of the exposed operator. Sadly, many of these accidents result in serious bodily injury or death. The lawyers at the Law Office of Verderamo & Escobar have experience representing individuals involved in boating accidents. If you or someone you know was involved in an accident involving a personal watercraft, please contact our personal watercraft accident lawyers in Naples, Florida at (239) 775-1004. Personal Watercraft accidents are very common in Florida. The state of Florida extends out to form a peninsula surrounded by the Atlantic Ocean and the Gulf of Mexico. With tropical temperatures throughout most of the year, over a thousand miles of beaches and coastline and thousands of lakes, Florida is a haven for boats and personal watercraft. Personal watercraft accidents are, therefore, very common in Florida. How do personal watercraft injuries typically occur? The most common types of personal watercraft accidents involve collisions with other vessels, fixed objects, people, sea life and debris. Unlike on roads where cars must stay within their lane, there is no such thing on the water. Boats and personal watercraft travel in many different directions and change directions often. It is easy to become distracted and collide with another boat. Many fixed objects can be found at random locations out on the water. These may include channel markers, jetties, docks, piers, rocks, shoals, bridges, etc. . . . Other collisions occur with people who may be swimming, skiing, have fallen off of another boat or personal watercraft. There have been accidents involving collisions with marine life such as dolphin or stingrays that jump out of the water or manatees and sea turtles that are unable to submerge themselves quickly enough. Finally, it is not uncommon to run into floating debris when out on the water such as floating pieces of wood. Most of these collisions may be avoided by taking proper precautions and exercising due care when operating a personal watercraft. 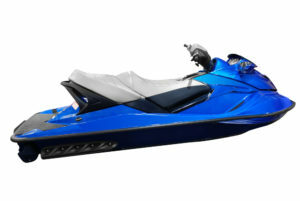 The rules regulating the use of personal watercrafts (PWC) are different than those of other boats. Given the dangerous nature of PWCs, there are separate rules regulating their use. These rules mandate the use of approved non-inflatable wearable personal flotation devices, they provide minimum age restrictions for operators, restrict hours of operation, place restrictions on certain dangerous maneuvers and in some instances require successfully completing an approved boating education course. Failure to comply with these rules can expose a person to both civil and criminal liability. If you were injured and are looking for personal watercraft lawyers in Naples or Ft. Myers, Florida, for a free consultation regarding your accident case, please do not hesitate to contact the accident attorneys at the Law Office of Verderamo & Nunez to discuss all aspects of your case.